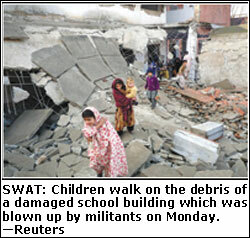 MINGORA, Jan 19: Suspected militants blew up five government schools in Swat on Monday. 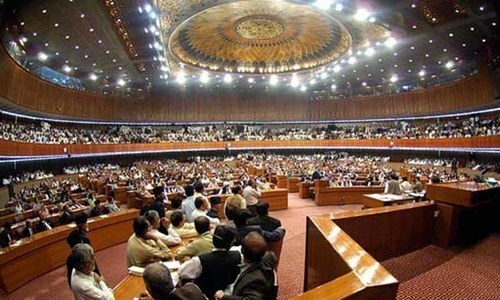 The schools are: high school for boys in Tawheedabad, high school for girls and primary school for boys in Banr, high school in Engaro Dheri and primary school for boys in Mingora. A guesthouse of one Hameedullah of Takhtbhai was set on fire in Madyan. Two paramilitary soldiers were injured when their vehicle hit a mine on Kalam Road in Shen area of Khwazakhela. Swat District Coordination Officer Shaukat Khan Yousafzai said 182 schools, most of them for girls, had been destroyed by militants, affecting over 100,000 primary- to college-level students. 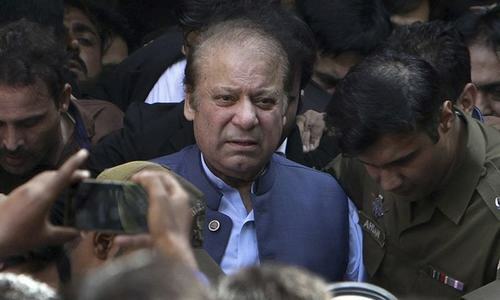 He said one could understand the reason for which the militants were attacking security forces but destruction of schools by them could not be justified. Local people said Monday’s attacks might have been carried out in reaction to recent statements made by the federal and provincial information ministers that all schools in the valley would be reopened. They said the ministers were unaware of the situation in the region. The principal of a private school said the district was under complete control of the militants, adding that attacks on five schools in Mingora testified to the absence of government’s writ.